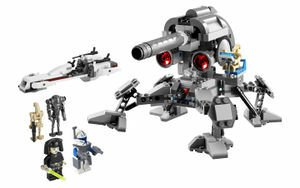 The set includes a Proton Cannon, BARC Speeder and five Minifigures. The Proton Cannon has many features such as posable legs that move side to side, up and down and a missile lanuncher for more realistic play. 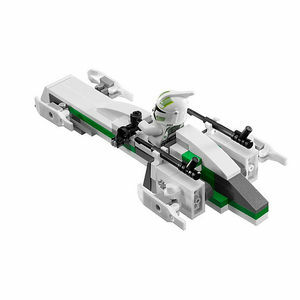 The BARC Speeder is of the same design as the one included with 7913 Clone Trooper Battle Pack except the Green border line of the Speeder is replaced with a Dark Red colour. Out of the five Minifigures included, one is exclusive, appearing in only one other standard-release set, another one one of them has appeared in only one other standard-release set and the other two are common. Luminara Unduli makes her second appearance to date, but this time dressed in the Clone Wars style. Captain Rex makes his second appearance (excluding Comic-Con Exclusive Clone Wars Set) to date who features no changes to the original design from when he appeared in 7675 AT-TE Walker back in 2008. 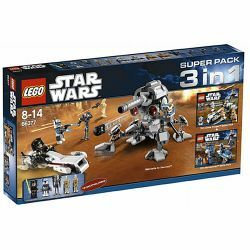 The other Minifigures include two standard Battle Droids and one Super Battle Droid which has made it's second appearance to date that features the Missile Launcher Arm that first appeared in 8018 Armoured Assault Tank (AAT). 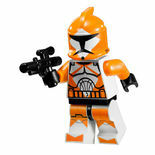 The Bomb Squad Troopers have completely orange moulded helmets with white and black printings to resemble the visors. They also have printed legs and other prints on their torsos. 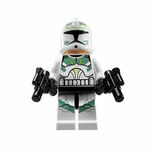 The Clone Trooper Commander has green printings on the helmet and torso to resemble a Clone Trooper from 'Horn Company'. He too has printed legs and other prints on his torso. The ARF Trooper features a helmet which is a brand new mould. The printed visor is precisely in line with the eyes of the minifigure wearing the helmet. The torso is that of a standard Clone Wars Clone Trooper and so therefore has no extra markings to show rank or battalion to which he belongs to. He is also the only minifigure in the set with no leg printings. The Speeder Bike is basic in design and is simple to build. It features no rare or unique pieces and uses mostly white, green and dark grey pieces. There are some flaws though in the design because when a minifigure is seated at the controls, if it were to fire at the enemy it would shoot the handle bars off. 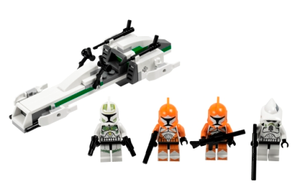 The set is a battle pack which contains 68 pieces to construct a gun turret hardstand, a gun tri-pod, Mandalorian bike, and four new minifigures, all of which are the same. 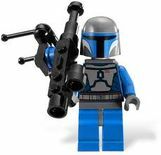 The Mandalorians include many new features such as a reprinted Mandalorian helmet which was previously used for Boba Fett, a new printed face, new torso print, and a new blaster pistol piece. The set is priced at £59.99 at British Toys "R" Us stores. Facts about "66377 Super Pack 3 in 1"
This page was last edited on 9 January 2016, at 19:52.